Eddie Colla, a participant in the recent Manifest Equality exhibition out in LA, just posted this video to Vimeo. 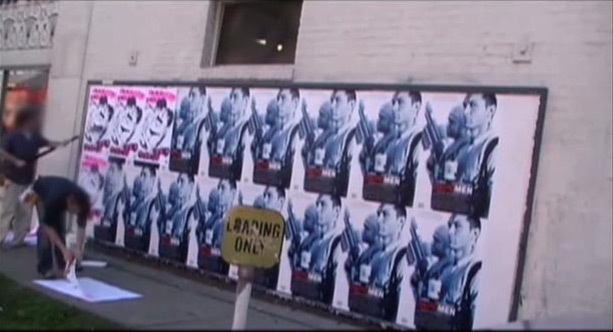 In it you will find shots of the show but more importantly, Eddie taking out a slew of illegal NPA ads in LA. I find this to be a wonderful example of proper use of public space. These messaging boards normally run the gamut of terrible corporate ad campaigns as evidenced by the poster for Repo Men, but their potential to be used to promote public concerns is exemplified in Eddie's recent activities. How incredible would it be if these spaces were typically used by the average citizen to express their concerns on pertinent social issues like gay marriage.